César Baldaccini, known simply as César (1921-1998) was born in Marseille and moved to Paris in 1943. In 1960 he introduced his famous “Compressions”: crushed cars, then other consumer durables given similar treatment. He defended his use of scrap metal – “Carrara marble was too expensive, there was old iron lying about all over the place” – and succeeded, like some latter-day alchemist, in transmuting it into works of art. In 1966 he turned to more malleable materials with moulded plastic and his “Expansions” in polyurethane, the definitive tribute to our modern age. 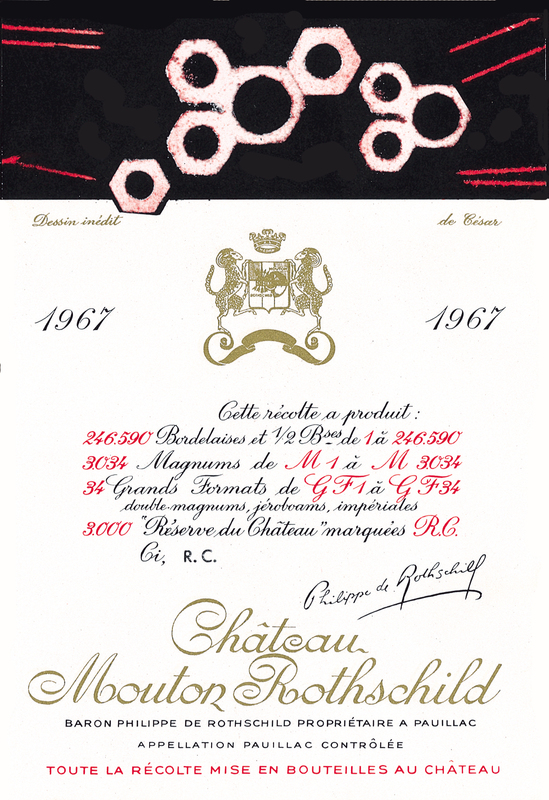 His composition for the 1967 Mouton Rothschild label also makes amusing use of present-day artefacts: paper clips, nuts and bolts.